During the week things are pretty hectic. Russell tends to work late and something always seems to come up. Once Saturday finally arrives, Russell and I tend to take it easy. Most fall Saturday mornings consist of us getting up with the little one and lounging around until college football begins. These lazy Saturdays combined with cooler weather make me crave warm and comforting soup. 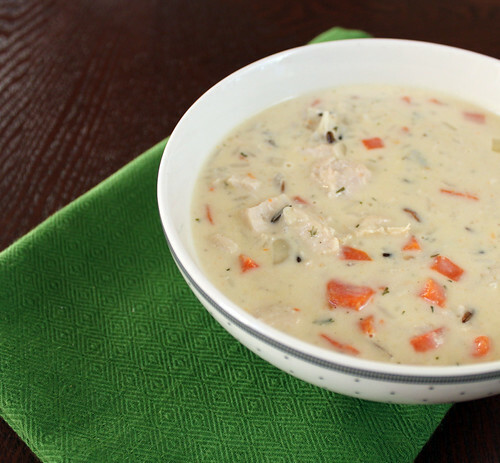 There are few things better than watching Alabama football while eating this chicken and wild rice soup with bacon! Out of all of the soups I have made so far this is one of my favorites. I had to stop myself from eating multiple bowls so we would have enough left over to enjoy it again on Sunday. 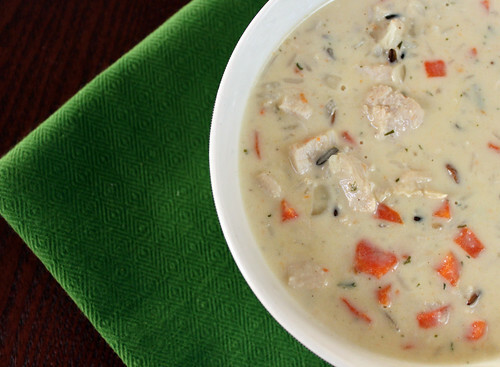 Tender chicken, flavorful carrots, rice, and bacon in a creamy base makes this soup perfect! Using the reserved grease from the bacon, saute the onions, celery, and carrots in a large stock pot until softened, about 5 minutes. Add in the wild rice, chicken stock, chicken, and bacon and simmer for 25-30 minutes. In a small bowl mix together butter, parsley, salt, pepper, and flour, stir in cream. Slowly whisk cream mixture into the simmering soup. Allow to simmer on low for 10-15 minutes longer until thickened.